I was raised in a Lawrence Welk and Hee-Haw household. When I encountered the Theme from Shaft, it, well, changed my perceptions of what music could be. Nothing against The Sons of the Pioneers, but Isaac Hayes was just a bit cooler! I don't remember where I first heard the Theme from Shaft. I DO remember going into a record store and buying a 45 RPM single with my own money. The record had been out a few year already, so it didn't break the piggy bank. I literally wore that record out over the course of a few months. 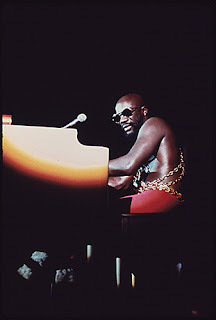 When I heard the news of Isaac Hayes's death yesterday, I was stunned. Another formative figure from my youth has passed. I cannot overstate your influence to me and to American pop music. You and your music are loved.